We are Denton’s only bespoke estate agency. Backed by Greater Manchester’s most highly regarded independent chain, we offer a unique one-to-one personal service that’s changing the way people buy and sell property in Denton. Area Manager Franca Carbone’s career in the property sector spans over 20 years and has covered roles in South Manchester, the City Centre and the Tameside area of Manchester. Franca is a specialist when it comes to the property market in Denton: she grew up and went to school in Denton and it is also where she still resides, so her knowledge of the area is second to none. Franca and her team offer a dynamic approach to selling property in the Denton, Audenshaw & surrounding areas, Providing a one to one personal service, Franca will remain in constant contact with you throughout the whole of your sale, guiding you every step of the way and working with you to achieve the best possible price for your home. Franca is supported by a handpicked team of exceptional sales people who have an excellent knowledge of the geography of Denton, Audenshaw as well as the surrounding areas: they know all the properties they are selling including their best-selling features. The team are fiercely competitive and have an enviable reputation for the highest levels of service. In addition all of our clients have a dedicated Sales Progressor allocated to the sale to ensure it proceeds to completion in a smooth and efficient manner. A key factor in maximising the amount of interest your property receives is how well your agent presents your property. Professional photos are a must. Upon instruction our specialist copywriters create a well written glossy brochure with scaled and measured floor plans; location and land registry maps all set within a contemporary brochure template. We take professional architectural photographs of your property using advanced photo software with wide angled lenses; optimum lighting and creative framing to maximise the impact. All of this first class presentation also appears here on our website along with the Rightmove property portal maximising the exposure the property receives nationally and beyond. For those wishing to be within 5 miles of the City Centre or within easy access of the M60 & M67 network link, both Denton & Audenshaw are perfectly situated. Audenshaw has regular trains/trams into the City Centre and Denton has frequent bus services into the City as well as Stockport, Ashton-under-Lyne & Hyde. The property market is buoyant in the areas as they offer a large range of different types of properties to suit a broad spectrum of homeowners. Local amenities include Crown Point North Retail park with a range of well know chains including River Island, JD Sports & Flannels as well as many supermarkets, restaurants and gyms. There are a significant amount of nurseries and for sports enthusiasts there are 3 semi professional cricket clubs, 2 golf clubs and a rugby club located within the M34 area. Franca is passionate about supporting her local community and has gladly provided sponsorship to local sports teams. Franca & her Denton team were delighted to sponsor the Denton West End Community Library Christmas Tree. 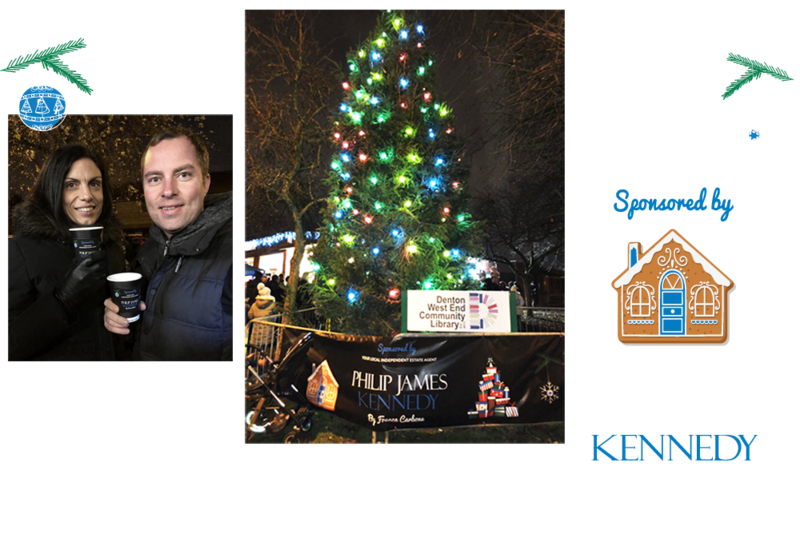 Switching on the Christmas tree lights whilst sipping mulled wine was a lovely community event and we we’re delighted to be involved. I was impressed by the contact I had with all 3 major contributors: Franca, Daniel, and Lisa. I interviewed 5 estate agents, of which PJW happened to quote the lowest fees.The property in question had an unusual history, yet Franca was able to achieve a price that was higher (correctly, I believe) than any of the other 4 had even suggested listing it at, no doubt helped by Daniel's excellent photography and brochure, and locked in by Lisa's stellar negotiations during the transaction. Thank You. Selling my dad's house was an emotional business as it had been a family home for approximately 50 years. Franca from Philip James made the whole thing a lot easier. She gave me prompt updates, sound advice about how best to list the house and at what price. The sale went through quite smoothly with the help of her colleagues in the branch. In the final weeks Lisa kept things on track and we completed on the agreed date with no glitches. Thanks to everyone involved from Philip James.